Looks like Sally is looking to expand her series of successful salons and move into the luxury spa business! At first glance, it would be easy to write off Sally’s Spa as another bit of girly fluff, but this is a surprisingly fun little game. Definitely one of the better time-management games out there, first-timers and established fans of Sally’s Salon or Diner Dash alike will be delighted with this game. 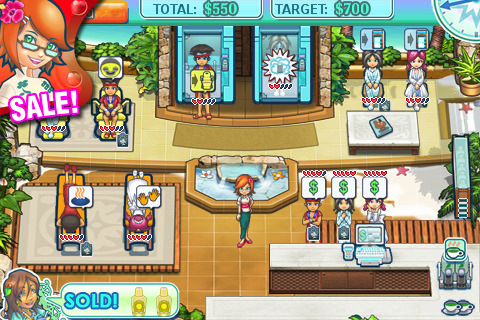 Sally’s Spa, like many time-management games, is built around running a business. You can boil down the basic gist to this: try to serve as many customers as you can, as quickly as you can, to make as much money as you can, so you can expand your business empire. It’s a tried and true model that has worked for dozens of similarly-themed games in the past, but Sally’s Spa throws in a nice twist by giving you some variety in the customers. This customer variety was something I had never seen before, and I thought it was a nice addition. The customers have different levels of patience and tipping generosity, so you have to actually put some thought into what order you see customers to maximize profit. It’s a small addition, but it adds a much-needed layer of strategy to an often tired genre. Sally’s Spa also has a few little mini-game aspects to it that I thought were cute and help break up some of the tapping monotony. For example, customers requesting a hot stone massage need you to place a missing stone before you can proceed with the massage. I’m not the biggest fan of time-management games, but the part I usually find the most fun is buying new things for the shops, because it’s satisfying to see them expand, and I think Sally’s Spa handles this especially well. There’s a large variety of stations to add, upgrades to install, and little extras, like scented candles and herbal tea, that not only make performance better, but gradually make your line of spas that much prettier. And the game is quite pretty, with very clean and clear graphics, good sound, and generally smooth performance. I think I’d prefer it if these games weren’t all overtly and rather painfully girly, especially since I could see plenty of guys enjoying Sally’s Spa, but that’s just my own personal gripe. Although the game starts out a little too much on the easy side, it still represents several hours of smooth and satisfying gameplay, and, all my gender gripes aside, it is a truly polished and shining example of the genre. AppSafari review of Sally’s Spa was written by Tracy Yonemoto on April 6th, 2010 and categorized under App Store, Featured, Fun, Games, Time Management. Page viewed 6216 times, 5 so far today. Need help on using these apps? Please read the Help Page. This game is crazy addicting. So gooood.